120 Years Of Electronic Music. 120 Years of Electronic Music* is a project that outlines and analyses the history and development of electronic musical instruments from around 1880 onwards. This project defines ‘Electronic Musical Instrument’ as an instruments that generate sounds from a purely electronic source rather than electro-mechanically or electro-acoustically (However the boundaries of this definition do become blurred with, say, Tone Wheel Generators and tape manipulation of the Musique Concrète era). Modes of interaction for performers and composers: Atonality and just intonation as a theme in instrument design. The ideas put forward in Ferrucio Busoni’s ‘Sketch of a New Aesthetic of Music’ (1907) inspired a generation of composers to explore micro-tonal and varied intonation and Hermann von Helmholtz’s ‘On the Sensations of Tone’ (1863) provided an understanding of the physics of sound suggesting the possibility of creating an unlimited palette of tones and shapes beyond the restriction of traditional instrumentation. This lead directly to the design of several new instrument; Thadeus Cahill’s Telharmonium (1897) and Jörg Mager’s Sphäraphon (1920s) amongst many other, that explored new forms of interaction freeing the composer and musician from the ‘tyranny’ of the fixed tempered Piano keyboard (which at the beginning of electronic music instrument design was a fairly recent standard). Though this experiment was ultimately doomed due to commercial pressure on instrument designers to provide simulations of existing instruments on a fixed tempered scale for popular music, the concept survived into the 1960s in ‘serious’ experimental music with the era of the Electronic Music Studio; GRM, Milan, WDR, Columbia-Princeton Electronic Music Center etc. and even Moog (in the original instruments) and Buchla’s modular synthesisers. More recently interest in atonality and non-manual control has re-surfaced with software synthesis and audio computer languages. As well as developing new physical interface models another channel of exploration was to use electronic musical instruments to free the composer from problems associated with performers and performance; removing the musician from the process of musical production allowing the composer to create pure unadulterated music concepts. When this was first proposed – first proposed in Russia in the 1930s by Avraamov and later Hanert’s ‘Electric Orchestra‘ (1945), Percy Grainger’s ‘Free Music Machine’ (1948) and Murzin’s ANS Synthesiser ) this concept was considered extreme, utopian and unachievable and met considerably hostility from traditionalists This goal has mostly been achieved through digital software but what has been the effect on composition? After the 1917 Bolshevik revolution in Russia an utopian avant-garde movement inspired by Futurism and Anarchistic ideas developed which included radical new music and performance. New, atonal, music was written, new types of theatre evolved and new instruments invented to bring about this utopian age; Arseney Avraamov conducted a huge symphony of sirens involving warships, factory hooters and artillery and proposed the destruction of all pianos to free music of fixed tonation. It was proposed that a new scientific culture replace the old archaic cultural order– brought about by new electronic instruments and scientific investigations into audio and visual perception (this period is covered in some detail in Andrei Smirnov’s excellent book ‘Sounds In Z’). The Bolshevik government, traditionalists at heart and worried at their lack of control of this anarchic movement, suppressed it replacing it with a manageable propaganda based culture of uplifting, popular socialist realism; many of the former avant-garde were murdered, imprisoned or sidelined for the rest of their lives. Similarly in the early period of Nazi Germany (1933 onwards), Hitler’s government made moves to embrace Futurism and Modernism (for example; Marinetti’s Berlin Futurist Exhibition of 1934, Sponsored by Goebbels and the Nazi Kdf organisation and the final Berlin Bauhaus before it’s exile to the USA). Modernism was a key component of Fascism and early National Socialism; technology was promoted as a National Socialist principle; the Volkswagen (‘Peoples Car’), Autobahn’s, Film, Mass-entertainment (Controlled through the Kdf ‘Strength through joy’ organisation) and electronic music; the first every electronic music orchestra ‘Das Orchester der Zukunft’ at the Nazi sponsored Berlin IFA in 1933. Again, this avant-garde movement was finally suppressed in favour of conservative fascist popular culture during the late 1930s. ’120 Years Of Electronic Music’ is an ongoing web project initiated in 1995 by the author and musician simon.crab@gmail.com . The project is completely non-commercial and self funded. The aim is to make the information available on a free/open source basis i.e. you can use content in any way as long as the content owners are credited and it would be courteous if you could acknowledge the source by linking or referring to the site. A Chinese language version of ‘120 Years of Electronic Music’ (by Guangyu Dong at the Communication University of China School of Journalism (SSI), Beijing.) is now available here. A serious amount of research here. I will be visiting a lot. Thankyou. Very interesting and useful www site! Thanks a lot. I am using your work as a source on my DMA dissertation. Could you please tell me your location for my bibliography citation? I have been referring to it and using it four my course in the last years. I am happy it is available again. Thank you. I’m using your work on my Graduation Thesis. I found you site some years ago. I teach Organology and History of music in a conservatory in Spain i always recommend your web to the students: it’s fantastic. you have a winner. keep it up! Absolutely phenomenal site. You successfully pair detailed research with accessible writing—a very hard feat to pull off. Please keep it up. This is an invaluable resource. Are you the guy who played keyboards on progressive rock group in Arizona? Love the new site! Glad you are back. I use your resources for myself and my students a lot, dating back to 2004! I love history and i love electronic music, Happy days. Thank you Simon Crab. This is awesome. Wonder why I keep seeing a faint imprint of M. L. Severy and G. B. Sinclair behind every page viewed? Tech problem at my end or yours? Good work, some pictures I’ve actually not seen. Wonder also if you’ve seen some 50 or so of my columns in Keyboard Magazine in ‘seventies popularizing this history; and my Ph.D. Dissertation on the topic (1972) which is cited in New Harvard Dictionary of Music and New Grove Dictionary of Musical Instruments? Your site would be immeasurably improved if you cited your sources for both photos, quotes, and commentary, just thinking like an academic! Thanks for your comments and visiting the site – I’m honoured! I am planning to cite all my references…it’s quite a job! and the faint imprint; that’s ‘design’ maybe I’ll take it out? Ah Mr Rhea! An honour indeed! I just mentioned that I have a printout of the original webpage in my archive. I am quite sure you’re name can also frequently be found in there. I read your comment with great surprise and even grew bigger when I saw your signature. It is clear from the context that you are a person of great experience and a position both in Berkeley and in the scientific community. I wonder what is preferable; Provide knowledge to young people related to the subject or irrelevant without discrimination, titles, bibliographies, etc. or, ultimately, to remain from which sign is the subject of knowledge we are reading; You know, I come from a country (Greece) where in the fields of science, philosophy and arts we have spread the most all over the world without pandering, for example, paternity in medical terminology which is almost entirely in Greek. Whatever your project is worth and it is our honor to receive your knowledge even though through the website of Mr. Crab, which I find excellent not only for its object but for the trouble it has had to gather data on each instrument but also because without any remuneration, advertising offers its knowledge unselfishly. I’m so glad I’ve finally found a complete documentation of the progress of electronic music through time (as near to complete as it can possibly be). Will definitely post about this on my blog in the near future! Massive thank you! It’s awesome! This is for ‘Collective Intelligence’ to make better worlds i believe. There ‘s lot of works to record and set of things from history. The date in the permalink? I’ve corrected it – well spotted! thanks. Wow, that came just at the right moment. I am preparing a talk about electronic music and i am developing a software for creating new sounds and compositions of electronic music. Thanks you so much! Thank you very much for your amazing work in collecting and putting it out there! The first time i came across your work, it was in the shape of a pdf – its still on the webs somewhere. then this page that i used and loved lots. It was differently designed back then though, very simple. i was wondering wether you put your knowledge from a daytime job here? this is such a mountain of work for being a side-project! Hi – it should work now…let me know if you still have problems. What about the manifesto “The Art of Noises” (1913) by Italian futurist Luigi Russolo and the invention of his Intonarumori? Well, strictly speaking Russolo’s ‘Intonarumori’ were mechanical instruments not electronic so not really within the scope of this project. But of course the work of Russolo had a huge impact on how (much later) electronic music included noise and ‘non musical ‘ sound – musique concrète, Cage etc. Unfortunately the link to “1960: Bode 7702 vocoder” does not work. Simon … just a very big thank you for building and maintaining this great information resource!!! Absolutely great that this is back. A hardware copy of the original site has been in my archive for years. I just looked it up and it turns out I printed it in 2002! One idea / tip / advice: Why no take it further? Of course not to mention every synthesizer fad but some stuff that is available by now (like physical modeling, additive resynthesis and new controller concepts) fits perfectly in the stream of thought of all these inventors. I am sure that people like Thermen, Martenot and Trautwein would have drooled over such stuff. The biggest pity however is that so few people are aware of how beautiful and expressive the music from these instruments can be. We simply live in a trigger and forget culture of electronic music. Well, maybe tweak a filter pot now and then but I am sure you catch my drift. I actually condensed my personal view on the subject into a hardware setup that I call Starship One. Information about it (including pictures, written articles and even music composed on it) can be found on my website at http://www.brassee.com. In other words: The dream is still alive! Thanks Mike – I’ll get it fixed. This is excellent! May I cite your work? A project in my music history class requires one web-based source. Thank you for this! I did my social studies fair on the earliest electronic instruments (up to 1899) and used this for a lot of citation and information. Thank you for having this so readily available. Hello, this is a great site and reference resource! Kudos to you for all the hard work. I did note two key omissions. (1) the “electro-theremin,” invented in the late 1950s by session player Paul Tanner for use in film and TV work after having watched a theremin player “sweat bullets” trying to play the instrument in tune. Tanner and his instrument (referred to back then as “Paul’s Box”) was sought after very greatly. He did many TV shows including “Dark Shadows” and “My Favorite Martian.” But surely his greatest and most famous work was on the Beach Boys song “Good Vibrations,” which many people to this very day insist was a “real theremin” even though though the truth is now widely known. (2) In 1999, Tom Polk devised a more efficient version of the electro-theremin and called it the “Tannerin,” fondly named after Paul Tanner. Congratulations to such a beautiful website. I think it’s a great supplement to your website. Absolutely Awesome, many compliments for the research and resource! I have recently been in direct contact with AT&T historians at the AT&T Archives about the VODER. At my urging, they have uncovered two original ‘practice’ equipment racks and a good deal more documentation. There is more on the VODER on my website (www.steamsynth.com), and will be adding more as it is legally cleared. You’ve got a great site here and I’d love to chat sometime. 908-910-9551. As always, great work! I hope to nominate the work of George Breed, brilliant inventor and creator of several musical devices. At patent search will turn up not only his 1890 Electric Guitar, but the Lyrachord or Lyrachord-Symphonia piano, which seems to have some great features. Great site and deep. Internet at its best. I still have somewhere the panel we made for the exhibition in Naples. Missing the reference/about page. Could you identify this resource? Great article! It was a pleasure to read it. Very informative. Thanks. I have a few links to contribute to this awesome project, that i think relevant to the independent and experimental, open expression/source, art movement. While Plunderpalooza ’97 was widely reported in the Toronto and Canadian media, the New York Times has also mentioned Idiosyntactix once thus far in connection with our hosting of the Italian art group online project. As a web designer, since the beginning of it in 1993, i have designed all the above websites, at a time the ASCII design elements were essential for fast download, i have also designed the first website for a great experimental musician from Winnipeg, Canada Diana McIntosh. http://archive.groovy.net/dianamcintosh/ She performed on a few occasions, from what i remember, in the Music Gallery concert series organized by Ron Gaskin. It was great! I’m enjoying reading through this! I’d love to see the project adapted into print. I am really happy to find this resource. Thank you so much for making it. Fantastic references! – Sadly though it looks like the images for the Wobble Organ from 1951 seem to have been moved or removed. Hi Nano, thanks for pointing that out – fixed! An amazing endeavor. The research, analytical, sociopolitical and musical approaches could prove one of the most important projects for understanding contemporary mainstream and substream electronic music. Is there some kind of crowdfunding initiative where people can contribute? I would like to thank you very much for this demanding and highly informative project. As a pipe organ builder and electronic musician myself I could retrieve a whole treasure of additional knowledge. It would be great if you could extend your timeline and include also newer tools like i.e. the evolution and relevance of sampling, or the highly important developments of IRCAM (Max!) or Native Instruments (Reaktor!) etc. But again: Thanks so much for your fantastic work so far! It would be nice to be able to read from one Instrument to the next one chronologially. Or with a timeline. Misses RAI Milan’s Studio, IRCAM, CCRMA and the all the composers who actually have developed fundamental concepts without whom no electronic music would actually exist. It’s not just the gear, it’s, before all, the music ideas behind them. Whilst I agree that it’s ‘not just the gear’ – this project IS specifically about exploring electronic music through the technology first. I think there are plenty of musical resources that tackle music and ideas as a starting point. Hi Tabor, I dont think so. It is both. The instrument builder should be rated higher. We should overcome the paradigm of genius composer and his imagination as the primary force. Western ideology….Never seen studio bosses exploiting engineers´ creativity? Thanks so much for your fantastic work so far! can I suggest that, given the importance of the technology in this history and the growing recognition of its instrumentality that you also include the portable recorder at least & indeed other forms of ‘recorder’ & playback device, which have formed an important aspect of music created using electronic means. Felicitaciones desde Chile por tu trabajo y este sitio cuya utilidad es enorme e ilumina distintos ámbitos de la cultura, la ciencia, la tecnología y el arte sonoro. Congratulations from Chile for your work and this site whose utility is enormous and illuminates different spheres of culture, science, technology and sound art. Fantastic site! The references and vast knowledge is soooo appreciated. From a long-time radio guy in public radio and beyond. I started a new music/electronic music art radio show called “Earwaves” on KUNM-FM in Albuquerque in 1979…and so many years later, streaming a version of it on SomaFM.com which is a multi-channel streaming service based in San Francisco, CA. http://www.somafm.com/earwaves. Thanks again. This is a great reference site and knowledge base! It seems that Helmholtz is both the oldest synthesizer and also the oldest electronic instrument that has been properly documented. As your article mentions, it’s not strictly speaking a musical instrument but an overtone synthesizer. The University of Toronto has a perfectly working one , and it was just recently recorded for our project. We also managed to track down Elisha Gray’s Musical Telegraph(s): they (3) are located at the Smithsonian. Unfortunately they can not be played, and apparently they have never been recorded either. This is a fantastic site, and congratulations. I wonder why the BBC radiophonic workshop is not mentioned? The work of Delia Derbyshire on the Dr Who theme in 1963 surely counts as one of the most potent and popularised ‘musique concrete’? Thanks for your comment – I think it is mentioned ‘somewhere’ but yes, it does need it’s own entry! I just wanna share with you the fact that you have a completely random person, from a completely different country (Brazil), who is fascinated by electronic music and is completely mesmerized with how awesome this project of yours is! I just discovered and can’t believe how interesting this is. I honestly hope you turn this all into a book later. However the REST of your effort is spectacular! Very well done, keep going your good work! fantastic site for my PhD research. Thank you! Hopefully they will be useful. Ojalá les sean de utilidad. You should chat with Wally de Backer about his Jean-Jacques Perrey / Ondioline project. He’s an incredibly open and affable fellow who would be on your wavelength. I’ve put his bandcamp link in as my website. Thanks so much for compiling all this information. I’ve read every single entry now, great work! Donated! Hi Chris, thanks for your donation! thank you for sharing, giving, defining a history. Moog isn’t on the list on the left. Neither is the Hugh Le Caine “Poly”. See Gayle Young’s book, Sackbut Blues, for details. Thanks for your work! Donated. Great job, thank you. Donated. I do enjoy this resource, and every year point a new cohort of students to it, as an antidote to their prevailing opinion that a) all the innovation is happening now, at ever-increasing pace, and b) that music technology started somewhere around 1980. What strikes me, looking at the evolution of music technology ideas, is that so often, innovation comes from outside the ‘musical sphere’ – from engineers, scientists and crackpot inventors. It also strikes me that often, an idea that is ahead of its time can fail to ‘take root’ because the surrounding infrastructure simply isn’t there. I suppose this is ever the case with any evolutionary story. But the inference one can draw is that, sometimes, it’s worth revisiting history and the failed experiments for inspiration and to see if any of the ideas can now currently be implemented. An example is ambisonics, which was an early (1970s) record-and-play technology capable of full surround (with height). It languished for years in remote academic departments until computers caught up and make simple what had been clunky and expensive in the analogue domain. Now, it’s resurfacing, at the BBC and on youtube (etc) as a format, but also composers are taking more interest and some engineer/musicians are developing esoteric 3d musical instruments. Most will be one-off special interest oddities, some will become fashionable for a period (rather like the Theremin, Ondes-martenot etc) and some might become staples. 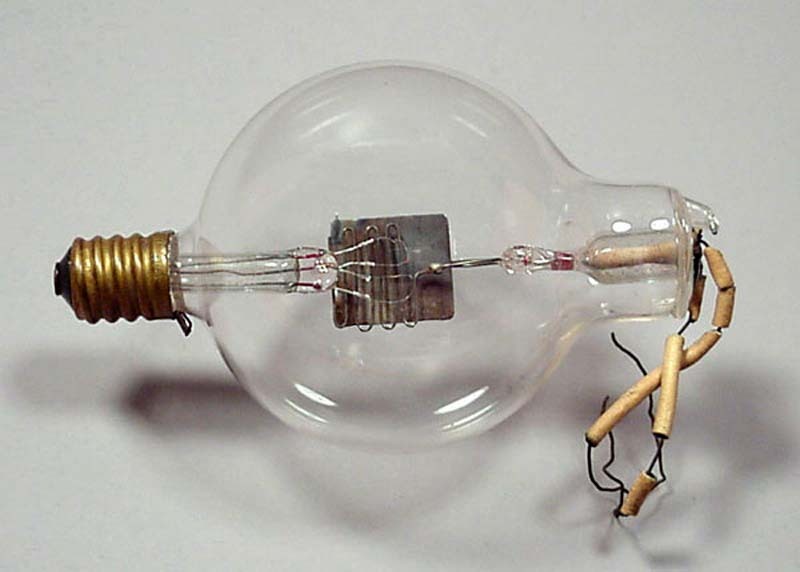 Hi -it’s an early De Forest Audion Tube. Please feel free to link to this video as you see fit. being a heavy synth geek i found here so many new/old curiosities i was not even aware of. just their exotic names is worth the trip. i ‘ve just finished reading ” Les Fous Du Son “, a fantastic book about synthesis history by Laurent De Wilde. your respective works are parallel and complementary, both very well documented. Two things, the first, can pleas put the replay box on the top of the comments? Second, what about the instroument of the 90, 2000, 2010? Thanks, I very apreciate your job. Yah this site is the greatest thing since sliced bread. Thank you and good luck to you, Simon Crab! Somehow, I’ve never come across this website until now. Love it…going to read 1 year every week. Hi, can you tell us, what kind of music include electronic musical instruments? The project is completely non-commercial and self funded?